The Battery Butler® Battery Storage Chargers are specifically designed for the maintenance of batteries that are stored or only used periodically. 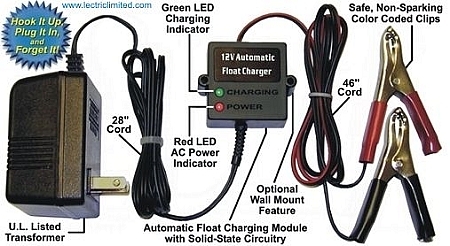 These chargers will prevent the normal self-discharge of your battery, while extending the life of rechargeable12 volt batteries, by providing a minimum current, regulated output. Other types of chargers provide a strong, rapid charge that tend to boil out liquids and decay electrodes. With the Battery Butler®charger, once your battery has been fully charged, it will automatically shut-off; then resume charging as your battery level drops. Works on ALL wet cell, gel-cell or the new OPTIMA™ batteries. Works on ALL years, ALL make & model car, truck or motorcycle batteries. The Battery Butler®Battery Storage Chargers are specifically designed for long term use. You can safely leave it connected to your battery for days, weeks, months, even years!